Learn more about embracing change for your business and yourself in Lean Enterprise and The Lean CEO. This post originally appeared on Barry O'Reilly's blog; it is republished here with permission. Leaders today are inundated with reasons to transform their organizations in search of better outcomes. New market entrants erode profit, competitors seem to be always moving ahead, all while customers seek higher quality and cheaper sources of service. The pace and appetite for change is exhausting. Yet comparatively, it feels like your organization is sinking deeper into the mud. “We want to change, but the culture here is too difficult to change.” It’s a frequent remark we have all heard and said, but what does it mean? Culture is the original business meme. Its meaning and usage are as abstract and intangible as the word itself. “If we just fix the culture, we will be successful”—a statement full of positive intent yet lacking a clear directive or step to take. A new culture is not a browser plugin. Leaders cannot simply select an extension, and download and install it from the web. Nor should leaders expect the update to be applied only to others and not to themselves. The prevailing thinking is the need to change people’s mindsets. The belief being if we tell people to think differently, they will act differently. All-hands meetings are called, PowerPoint decks are prepped, and an executive tour is scheduled to rally the troops for the mission ahead. A one-, maybe two-day training session is delivered, and the metamorphosis begins. But it does not. Culture is our behaviors. It is the actions we perform. The way we talk and how we treat one another. The way we behave reflects the values and expectations we have of ourselves and of one another. The single most important action of any leader is to role model the behaviors they wish to see others exhibit in the organization. Culture change does not lead with words; it leads with action. By changing the way we behave, our actions begin to change the way we observe, experience, and eventually see the world. By seeing and experiencing the world differently, it changes the way we think about the world. People do not change their mental models of the world by speaking about it; they need to experience the change to believe and feel it. Figure 1. John Shook’s Change Model. Image re-creation by Barry O'Reilly. John Shook was the first American manager to be hired by Toyota. He moved to Japan without knowing a word of Japanese, just with a desire to immerse himself in the organization for a prolonged period of time to learn the Toyota Production System by doing it. What he observed was not a group of managers telling people what to think or how to perform their work. Instead, he experienced the deliberate practice of experimentation, reflection, and improvement by all employees in the entire organization. Toyota had developed a set of behaviours that advocated continuous learning and adaptation to new circumstances. What Toyota understood is that culture and circumstance is always unique and changing, and to manage change, one has to be ready to learn, adapt, and apply new changes as they are happening. A journey for leadership and behavior. 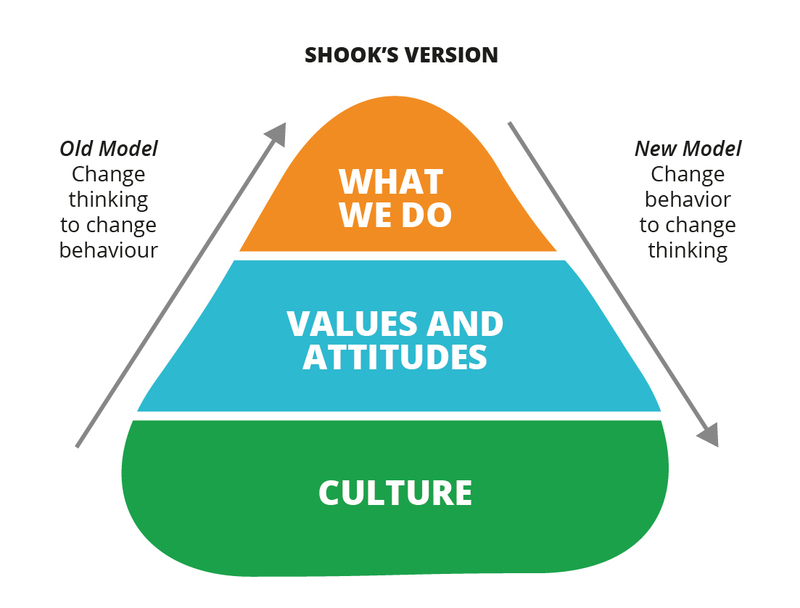 Shook’s model highlighted that transformation starts from our behavior. Therefore, to start changing culture we need to change how people do their work. In our experience, a very effective first step for a major transformation is to start with a set of hand-picked initiatives that do things differently. We did this together with the engine manufacturing company Wärtsilä. Wärtsilä is over a century old manufacturing company that serves roughly half the ships in the world and has five billion dollar revenues—not a typical Silicon Valley startup. To kickstart the transformation, leadership provided sponsorship and support to four cross-function teams to explore new ideas and ways of working. The purpose of these teams was to bump into and make visible the cultural glass walls that so often had stalled and hindered other initiatives. Rather than have the four teams take courses or workshop ideas, the underlying idea was to have four teams experience a new way of working for real. This was ensured by selecting the top strategic innovation initiatives for the teams focus on. The second step was to create an environment to cultivate the new ways of working. In other words, we made the workspace inspiring; different; and, importantly, we let the team personalize it to make it their own. We provided guidance, tools, and innovation frameworks for the people to leverage. To embrace Shook’s philosophy, it was extremely important that the teams had a mandate to work differently and to really experiment with new ways of working and new behaviour. The mandate created a psychological safety net for them. Failure is expected when working creatively and trying out new ideas, and therefore, it was critical to enable safe failure and learning opportunities. To further facilitate the cultural transformation, the teams broadcasted their intermediate results in demo sessions to the whole company. This turned out to be both popular and effective in further spreading the transformation by showing concrete results rather than talk of trying things differently. Figure 2. In the demo sessions, the audience gave scores to the teams, and the winning team always won quality craft beer. 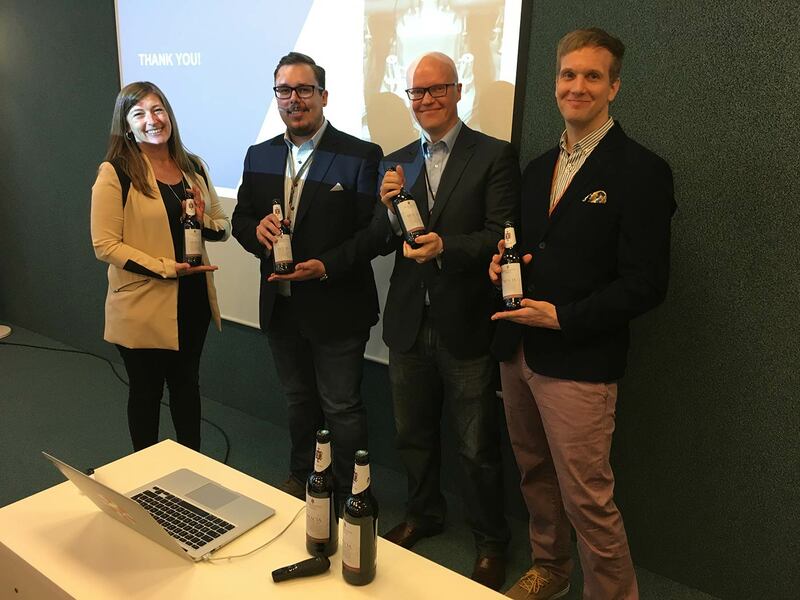 The happy winners of demo #1 from left: Shelley, Henri, Jan, and Martti of Wärtsilä. Image courtesy of Risto Sarvas. Throughout the eight-week program, the teams fully experienced working in new, interesting, and unforeseen ways. Rather than just reading a book or taking a course on Lean, Agile, and design thinking, the teams had to apply the new methods and mindsets while creating meaningful outcomes for the business. For the individuals participating in the program, it was an extremely effective way to safely learn new ways of working, and perhaps more importantly, to learn the limitations of the former company culture. What did we learn from running this, and similar programs? First, jump-starting the cultural transformation with a couple of spearhead projects, the right people, and leadership support is very effective. The projects will demonstrate that the company’s own people can achieve the desired results and business outcomes with new ways of working. Second, the people who have experienced new ways of working are transformed. Applying the new behavior into real projects transforms their thinking about innovation and the whole company, which makes them the key people in spreading the new culture. Finally, choosing the people to spearhead the projects is critical, as those people will become the ambassadors for a bigger cultural change in the organization. They will tell the stories and others will listen. They will introduce the new ways of working to others, as they are the people who know best how the new thinking applies to your company. They are the first penguins to dive into the cold water, swim, and survive. However, none of this matters if you, the leader of change, don’t change as well. As the leader of this change, you are penguin number zero: the very first person who has to change your behavior. You need to be transparent about your vision, words, and actions. You need to work according to the new culture you wish to see. Article image: Brooklyn Seeds mosaic. (source: Metropolitan Transportation Authority on Flickr). Risto is the co-founder of leanservicecreation.com and works at Futurice, a European digital consultancy. Most of his working hours Risto helps large corporations engineer their work culture through digital business transformations. Risto is also an adjunct professor at Aalto University, Finland, teaching design and social media.